In our profound quest to discover strange new worlds, we've inevitably been trying to find alien planets that possess any Earth-like similarities. Now, with the incredible find of an Earth-mass exoplanet orbiting a neighboring star at just the right distance for liquid water to persist on its surface, hopes are high that we may have discovered an "Earth 2.0" right on our galactic doorstep. But in our rush to assign any terrestrial likeness to this small exoplanet, we often forget that just because it's in the right place and is (apparently) the right mass, it likely has very little resemblance to Earth. And even if it does possess water, it could still be a very strange world indeed. In a new study headed by scientists at the French National Center for Scientific Research (CNRS) and Cornell University, computer simulations have been run to figure out the possible characteristics of the small rocky world that was discovered orbiting the red dwarf star Proxima Centauri. Located only 4.2 light-years from Earth, the so-called Proxima b was discovered by the ESO's La Silla observatory in Chile and astronomers of the Pale Red Dot campaign to much excitement in August. By measuring the slight wobbles of Proxima Centauri, the telescope was able not only to decipher the mass of the exoplanet, it could also calculate its orbital period. With this information, the researchers realized that the world was orbiting the red dwarf within the star's "habitable zone." The habitable zone of any star is the distance at which a planet can orbit that is not too hot and not too cold for liquid water to persist on its surface. The implications are clear: on Earth, where there's liquid water, there's life — if there's liquid water on Proxima b, perhaps there's life there too. And, if we look for enough into the future, perhaps we might one day become an interstellar species and set up home there. But it's worth remembering that we currently have very little information about Proxima b. We know that it has an orbital period of a little over 11 days (yes, a "year" on Proxima b is only 11 days). * We know it orbits within the star's habitable zone. We also know its approximate mass. However, we don't know whether or not it has an atmosphere. Also, we don't know Proxima b's physical size. If we don't know its physical size, we can't calculate its average density and therefore there's ambiguity as to what materials it contains. So, in an effort to confront this ambiguity, the researchers ran some simulations of a 1.3 Earth-mass world (the approximate mass of Proxima b) in orbit around a red dwarf star to see what form it might take. Compositions for a simulated Proxima b. Left: At 94% the diameter of Earth, Proxima b would be domiated by a massive metal core and smaller rocky mantle. Right: At 140% the diameter of Earth, Proxima b would be an ocean-covered world. Middle: Somewhere in between, Proxima b would approximate Earth. Assuming the rocky world has the smallest physical size allowed for its mass (94 percent Earth's diameter), according to planetary formation models this would consist of a metal core, making up for 65 percent of the mass of the entire planet. The outer layers would consist of rocky mantle and very little water (if any). In this scenario, Proxima b would be a rocky, barren and dry world, resembling a massive Mercury. Last time we checked in on Mercury, it didn't appear very "habitable." But this is just one possibility. The researchers then shifted the scale to the other extreme. What would happen if the physical size of the planet was pushed to the maximum? Well, the mass of Proxima b could support a world that is 40 percent bigger than Earth. Now things get interesting. In this scenario, Proxima b would be a lot less dense, meaning there would be less rock and metal. A huge proportion of the planet's mass would consist of water. In fact, 50 percent of the entire planet's mass would be water. This would be a "water world" in the strongest possible sense. Alas, this version of Proxima b is just one possibility over a huge range of scenarios. So, yeah, from this study alone, Proxima b is probably not very Earth-like. Habitable Zones Not So Habitable? Just because a planet orbits its star in the habitable zone, it doesn't mean it has the same life-giving qualities as Earth (keep in mind that both Mars and Venus also orbit the sun within our solar system's habitable zone). Proxima b orbits very close to its star. It's the nature of the beast; red dwarf stars are small and therefore cooler than sun-like stars. Proxima Centauri's habitable zone is therefore one hell of a lot more compact than our sun's. The Proxima Centauri habitable zone is well within the orbit of Mercury. If a planet got that close to our hot sun, it would be burnt to a crisp; for a planet in orbit around Proxima Centauri, this location is an oasis. But when you orbit so close to a red dwarf, a planet starts to succumb to some tidal difficulties. One face of an orbiting planet around a red dwarf will be constantly facing the star, meaning the planet's spin matches its orbital period. One hemisphere of the planet is in constant light while the other hemisphere is in constant darkness — a situation called "tidal locking." So, in this case, let's imagine the orbiting exoplanet really is a textbook "Earth-like" world with just the right composition. A world with an iron core, rocky mantle and enough water on the surface to create liquid water oceans that could support life. But this world is tidally locked with its star — that's got to cause some problems, right? Let's assume that this planet somehow possesses an atmosphere (more on that later), to have one hemisphere being constantly heated while the other hemisphere is constantly frozen certainly doesn't sound like a good time. Many simulations have been run in an attempt to model the complexities of the atmospheric conditions in this situation and most outcomes aren't good. Some scenarios predict planet-wide hurricanes that act like a blast oven, other scenarios predict a dry wasteland on the star-facing hemisphere and a frozen solid dark hemisphere. In other research around atmospheric dynamics of tidally locked exoplanets, there could be a situation where the world has efficient "air conditioning" — hot air from one hemisphere is distributed about the planet in such a way to balance global temperatures. But this assumes a high degree of friction between the lower atmosphere and a craggy, rocky surface and efficient high-altitude air flow. But the ultimate kicker when considering "Earth-like" exoplanets around red dwarf stars is that just because red dwarfs are small, it doesn't mean they are docile. In fact, red dwarf stars can be downright violent, frequently erupting with powerful flares, flooding any nearby planets with ionizing radiation. This radiation, plus inevitably powerful stellar winds, would likely blow any atmosphere away from our hypothetical burgeoning Earth 2.0. Without an atmosphere, the only vaguely habitable location on that planet would be under the surface, perhaps in a sub-surface ocean protected by an icy crust like Jupiter's moon Europa. But, like Earth, if these planets have a powerful global magnetosphere, perhaps the worst of the stellar storm can be deflected and an atmosphere could form, who knows? Though there are many challenges facing our search for "Earth 2.0," we are only just beginning our quest to seek out alien worlds orbiting other stars. 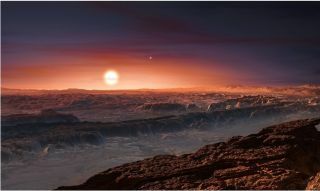 Yes, it is an incredible stroke of luck to find a small world orbiting a neighboring star, but as red dwarfs are the most populous type of star in our galaxy, the odds are that a handful may well have just the right ingredients to support a habitable atmosphere. But is Proxima b one of those diamonds in the rough? For now, with the tools at our disposal, we simply do not know. Perhaps with the launch of NASA's James Webb Space Telescope in 2018 we might be able to tease out the spectroscopic fingerprint of an atmosphere, but that would likely be beyond its capabilities. So we might just have to send an interstellar probe there to find out if Proxima b is really the habitable exoplanet everyone hopes it will be.